The vertical axis (VA) system has been touted by some growers as the next logical step from free standing central leader trees to high density supported systems. The main reason cited is the great similarities between the systems and the low emphasis on limb manipulation by tying. There are ladders used in picking, but with a flat tree wall at ladder height it is quite fast and simple to manage ladders. Even though the VA system is one of the taller systems used in high density supported systems, there is still a critical need for lower limb development. These lower limbs will form a fruiting table yielding perhaps 60% of the crop and must be established before the trees should be allowed to grow taller. Proper development of the bottoms of the tree will allow 75% or more of the fruit to be picked from the ground. Cultivars that have a high requirement for light (e.g. McIntosh) are well suited to this system. Other cultivars like Gala, Goldrush, Golden Delicious and Empire have a growth habit highly suited to this system. 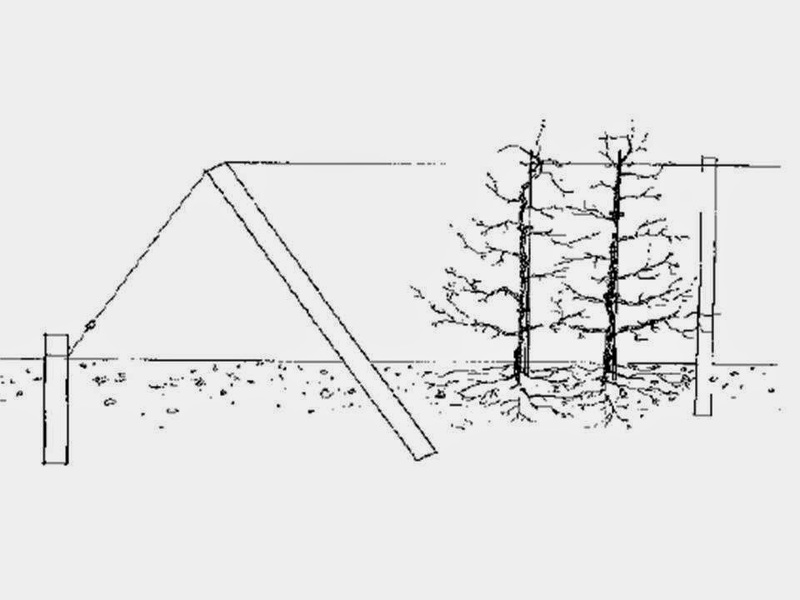 VA systems allow trees to grow taller than SS systems. The system basically consists of one or more high tensile steel wire(s) drawn tight and supported 2 - 3 m above the ground by a series of in-line posts spaced 9 to 15 m apart. The closer the spacing for the inline posts, the higher the degree of stability of the support system under strong wind or high cropload conditions. Individual trees in the row are supported by vertical leader supports that reach up to the top support wire. The tree consists of a conical, or "Christmas tree" shape and grown up to 3.5 - 4.0 m tall. The leader is not pruned until the tree reaches its full height. Shoots arising on the side of the axis or trunk close to and competing with the leader are removed as they arise or during the dormant pruning season. Side branches on the leader are renewed on a periodic basis. The VA support system is somewhat more complex than the SS to install. It does require a high level of skill to build the support system and be sure it is adequate to hold the trees and crop load. A post failure in this system can result in the loss of several trees. The standard anchoring system now in use is the "auger anchor" which is screwed into place. Posts are generally pounded or watered (water gun) into the ground.